First of all, this name is pretty badass. A rhythm wolf? It’s Akai Professional’s drum machine and ‘bass synth module’. With five analog drum sounds: an analog kick, snare, percussion synth, open and closed hi-hats, and a single-oscillator bass synth. You get two modes: performance or step mode, allowing you to either play the bass with the lower keys or by certain steps. Let’s take a look at the other features of the Akai Rhythm Wolf. Akai Professional has been in the lab working on new music equipment to adapt to the ever-flowing trend of digital and computer rigs. We’ve provided you with a little overview of their famous MPC drum machines and samplers; however, they’re also moving towards the digital movement — it is the year 2014. The MPC Element is a very small in size (only about 2 lbs!) controller for both the Mac and PC that is typically used for MIDI. It gives you the beat and song creation capability of it’s famous and well-known MPC drum machines into your computer. What’s most notable of this is the pads with pressure and velocity, for those who like the natural swing and feel of pressing those buttons for drums or other sounds. I’m a huge fan of these and always will be — both for live performances, recording, as well as just messing around and jamming with a drum kit I like. These sounds are controlled entirely by your computer, depending on the VST or software you’re using. This gives it the ultimate customization, not restricting you to uploading particular sounds into the MPC in order to choose what comes out of it, which many nowadays would consider a hastle. 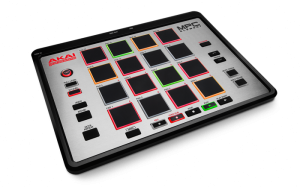 Here is a detailed overview and review of the Akai MPC Element.